I didn’t ride my spin bike for a couple of weeks mainly because the last time I rode it my problematic incision hurt a lot. 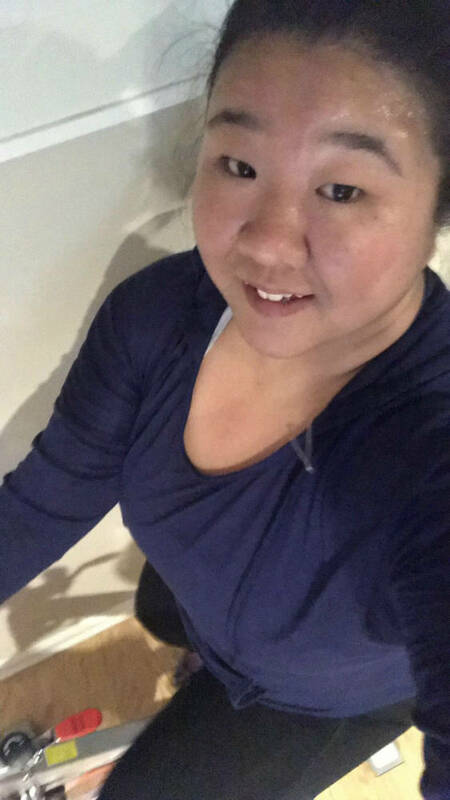 I’m not trying to do anything that sets me back from running anymore so I took a break from spinning … even though one of the reasons I bought the spin bike was so I could get in cardio since I’m not running. Another reason I didn’t ride was because spinning hurt my knees. My knees would feel like they were burning and by the end of a 30 minute workout they would feel like they were on fire! I decided I wanted to try a short, easy spin last night and looked up reasons why my knees might hurt. If you’re a regular spinner you probably know where this is going. It turns out I just had the seat and handle bars in the wrong settings. I thought I had them adjusted correctly but the seat was too low and the handlebars were too high. Once I adjusted everything my knees felt fine! From what I read a good rule of thumb is to adjust the seat so it’s even with your hip, and then adjust the handbars so they are even with the seat. That definitely did the trick for me – it was like night and day! Now I understand how people can truly enjoy spin :). 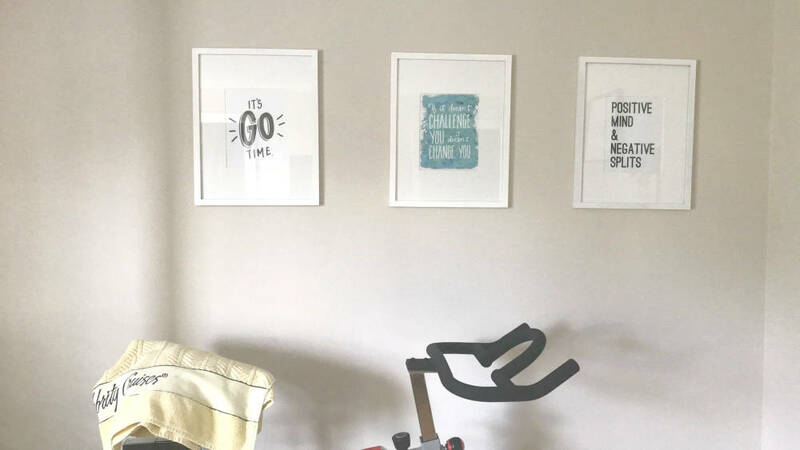 I’m excited to spend more time on my bike this year, especially now that I’ve hung these motivational prints up in my gym! “Positive mind and negative splits” is a saying that I hope accurately describes my life as soon as my doctor clears me to run again :). I see him again on the 17th, and I sincerely hope that is the last time I ever seen him again in my life. No offense because he’s a very good doctor but I’m over this whole thing in a way that I can’t even put into words. Another saying that I hope accurately describes my life this year is “she became a good cook” lol. Seriously though, I make the same things over and over again, which honestly doesn’t bother me much. I’m a creature of habit – but at the same time whenever I do branch out I’m usually pleasantly surprised. I want to try and make at least one new dish per week this year. 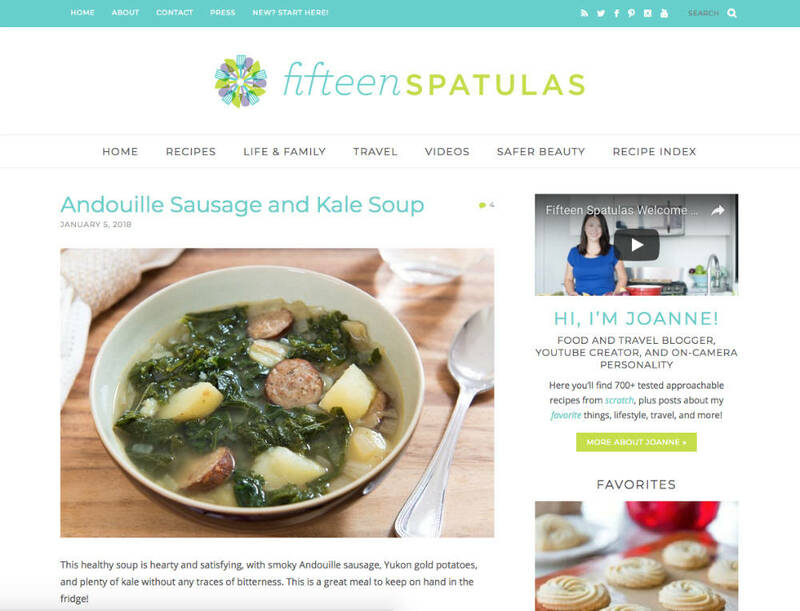 I found this new recipe blog, Fifteen Spatulas, that I think will be a good resource. 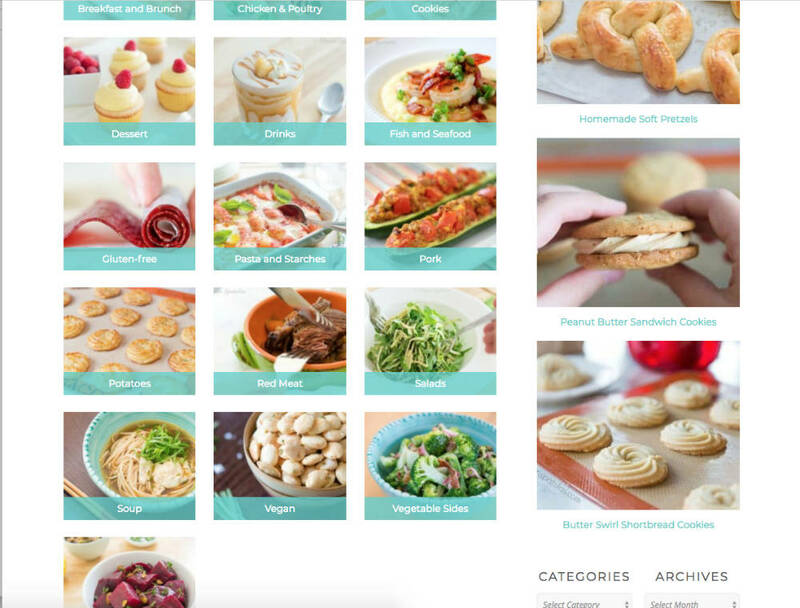 Joanne, the blogger, has recipes broken up into categories including gluten free, vegan, soups, desserts, etc. I’m excited to try a few recipes over the next month! I’m especially excited to try that sausage and kale soup although I’ll probably sub in chicken sausage. I love a hearty soup! Like so many other people this time of year, I’m also trying to snack healthier. I usually have a Kind bar as my mid-morning snack, which isn’t terrible, but I want to try and have veggies instead. 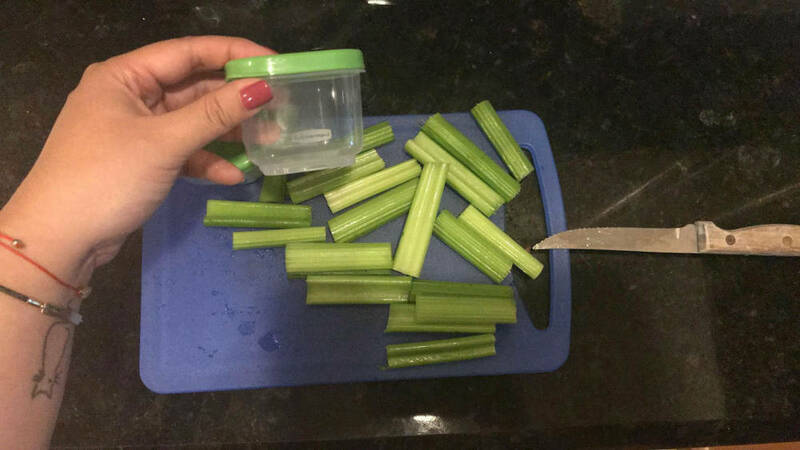 I bought these little containers to put dips like hummus and peanut butter in to go along with my veggies. Being able to just grab pre-cut veggies and a container will make choosing this snack easier. Not that it’s super time consuming to slice up veggies or anything but mentally it can feel that way if I’m in a rush. You know who’s never in a rush? 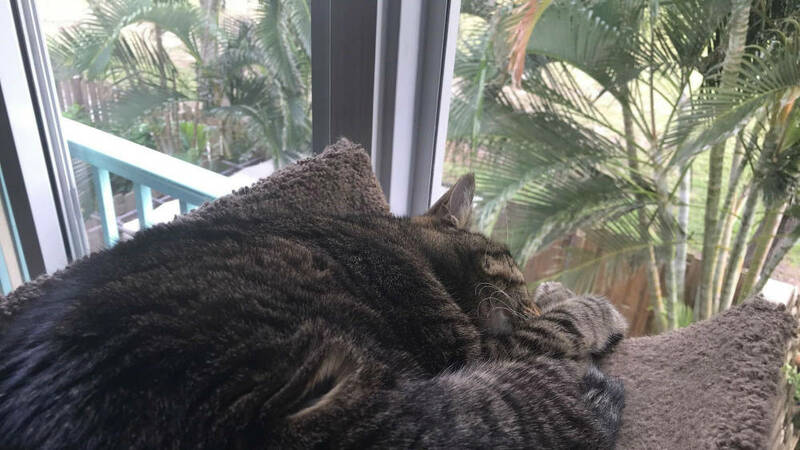 This cat. Cecil’s been on his medication for a few days now and I can already see a difference in his behavior. He’s not screaming for food non-stop anymore which is nice for everyone! He also willingly taking his pills now. Of course there is some bribery involved but at least he’s taking them without putting up a fight. Basically I give him one treat before the pill, then he takes the pill, and then I give him three treats after. Cecil is very treat motivated and takes the pill pretty quickly to get the reward at the end! I think he’s going to go for his procedure next month. First I want to visit the hospital where he’ll have it done, and I want to meet the specialty vet in-person. That cat is everything to me, I have to know he’s in good hands. What’s your favorite recipe site/blog? Any spin tips for me as a beginner? Previous Post OMG What Did I Do?!! Glad you figured out how to make the spin bike feel better! One of the nice things about taking classes at a studio is that the instructor will show you how to adjust the bike correctly. Mine feels pretty good but I always wonder if I have it set up exactly as it should be! Ahh yes I am sure there is so much I could learn from taking an actual class. If only my anxiety over actually taking a class didn’t prevent me from signing up every time. IDK what I’m so scared of but I just know it’s going to be a terrifying experience lol. I’m so glad you adjusted the bike and your knees feel better. I was going to suggest that! Spinning bothers my ITB and so does biking. My little brother adjusted my bike for me so I know i have it correct, but it still hurts. It’s crazy, the activity that bothers my ITB the LEAST is running! Cross training bothers it. BLAH. Your gym prints are beautiful! I like “It’s go time”. I want that for my classroom! Maybe I will make one! That is so crazy that running hardly ever bothers your ITB when other things do… but so nice! I would give up everything else as long as I could run! That’s great news about your bike. I feared the worst!! One of my favorite cooking websites is IowaGirlEats. Do you ever read her blog? She does such a good job describing the recipes, I feel like a pro! I am now getting Food Network magazine and I’d like to try a new recipe every month out of that magazine. I do cook a lot though, but I still enjoy finding new favorites! I have never heard of her blog, i am going to check it out now! Thank you! I used to have a subscription to Food Network magazine… and I was OBSESSED with Chopped. I should look into renewing my subscription! 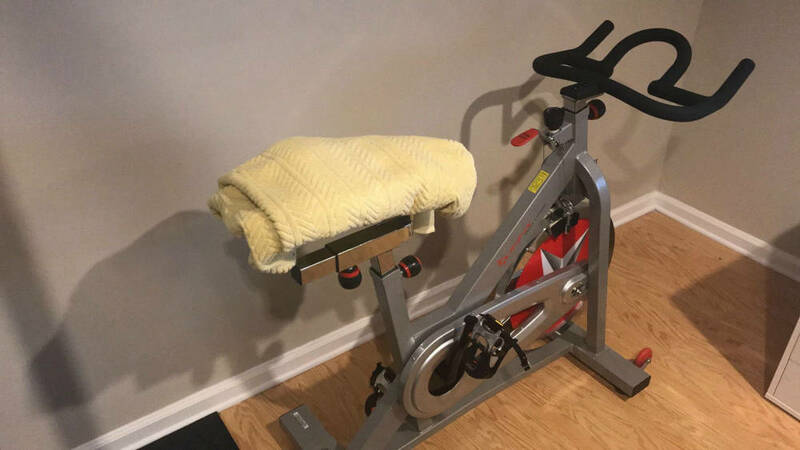 Noticed you put a towel on your spin bike seat. Not sure why they make spin bike seats so hard, but I found a great solution that works. After getting a referral from another friend I spin with, she recommended something call a Komfy bike seat cover. I ordered this a few months ago from http://www.sokomfy.com and this did the trick. Much more padding than padded shorts and it can be washed unlike gel seat. You should look into for your readers.